These beautiful DIY fresh pine wreaths add so much elegance to your holiday decorating and they’ll keep for most of the winter in cold climates – simply remove the red ribbon and add a snowman figurine or ornament. You can keep costs down too, since the base for this wreath is recycled from wire coat hangers. I usually purchase a large pine garland each year and make several of these wreaths for both indoors and outdoors. Shape your wire coat hanger into a circle. If your hanger is not strong, you may need to use two or three together to hold the weight of the wreath. The coat hanger hook will be your hanger. If you require several hangers, wire them together in a few places to make the assembly easier. This wreath will be very heavy, so be sure that your wire can support the pine. Starting at one end of your garland, secure the garland to the coat hanger with wire. Wrap the garland around your hanger, securing often with wire. Be sure that the garland is completely secure to the hanger. If you hang this on a door that will be opened and closed often the garland will shift and may even slip out of the wire, so take extra care when securing to hanger. Using wire, attached small pieces of fresh holly and berries or hot glue the berries to wreath. I prefer to use wire only as the hot glue can sometimes leave a burn/scorch mark when applied to the fresh garland. Wire a red ribbon to the bottom center and you are all finished. I don’t usually keep the garland for future use, but I do keep the berries and holly once they have dried for other projects or to be inserted into a new wreath the following year. 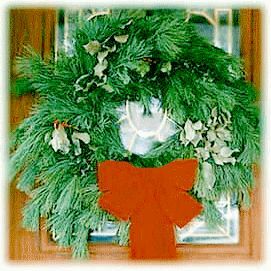 These are wonderful wreaths that can be used all winter long and if kept outside they will last for the whole season. They become a little brittle and some pines will fall, but they still remain beautiful.